I posted elsewhere today that I should perhaps write something up about this, so here it is. This isn’t the only way to do it. It’s possibly not even the best way to do it. But it’s the way I do it. First a bit about kit. I’m currently using a Canon 450D connected to a laptop via the USB connector and running AstroPhotography Tool (APT) to control it. Given a programmable remote it’s entirely possible that the laptop would be unnecessary. I have the camera connected directly to the visual back of a Skywatcher 127 Mak using a T-ring (no diagonal). 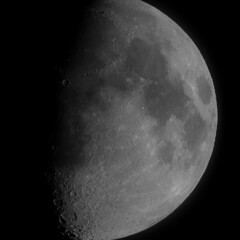 The 1500mm focal length of the Mak gives me an image that fills the frame of the 450D just about perfectly. Unless you have a full-frame camera or a focal reducer you’d probably not want to go beyond this focal length. If you use a shorter focal length them the image size on the sensor will reduce proportionally. That is, using a scope with a 750mm focal length you’ll get an image that about half covers the frame height of a 1.6x crop sensor DSLR. I’ve modified my 127 Mak to fit a Skywatcher motorised focuser with a 5:1 drive reduction which means I can tweak the focus in tiny amounts whilst sitting at the laptop. The telescope sits on my EQ3-2 with the after-market dual axis motor kit fitted. If you’re using a short focal length then you might get away with an alt-az mount, but at the focal length of the Mak my experience is that poor tracking fouls up the stacking process. There’s no reason not to use another type of DSLR if it there’s a way to get it to take the required images in the first place. In any case what’s required is a good number of RAW images taken in quick succession. 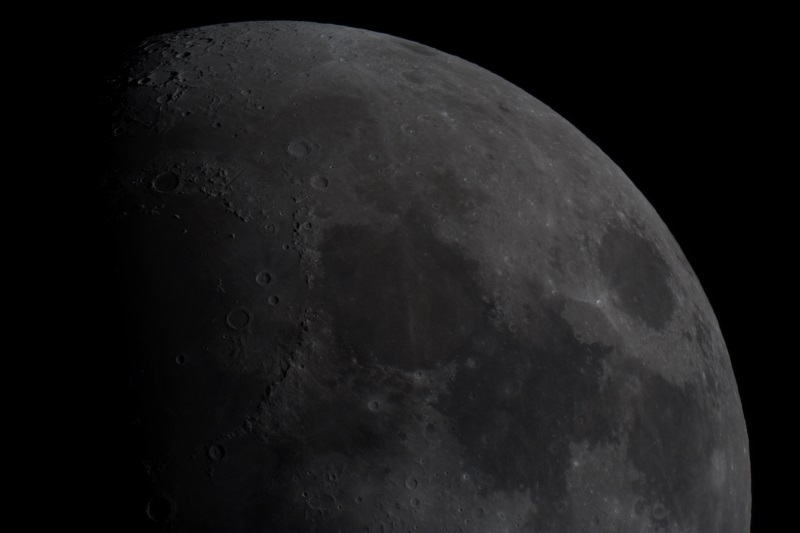 I start by getting the scope lined up fairly centrally on the Moon visually and worry about getting the focus right with the camera later because I can use the Live View in APT to focus. 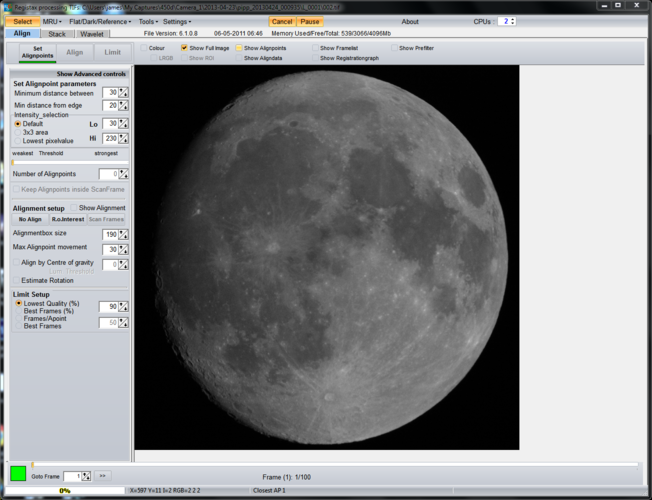 Working without a laptop or with a non Canon camera it may be easier to focus on a bright star using a Bahtinov or Y mask first, then move to the Moon without touching the focus. With APT started up and the camera connected I enable live view and centre the image using the motor controls, turning down the default Live View ISO And shutter speed settings if required to give a clear but not overly bright image. If the image is a long way out of focus I first get reasonably close based on the image I can see. I then find a good group of craters near on the terminator, click on them to move the 5x magnification box and go to 5x magnification. In anything but absolutely stunning seeing the Moon may appear to ripple and drift in and out of focus. Running the focuser in and out I try to find a point where the focus is similarly bad either side of focus, then home in on where “perfect” ought to be. Occasional moments of good seeing allow this to be fine tuned until I have things the best I can. If the seeing is near perfect I might then repeat the process at 10x magnification though I usually find it doesn’t help matters that much. With Live View now turned off I start a plan configured in APT to take 120 frames of 1/1000th second at ISO800 with a three second delay between each. Images are stored on the PC in RAW mode. Using a programmable remote it’s possible to do the same. Given a frame with plenty of space around the Moon image I’d just leave it to run, but because there are only a few tens of pixels top and bottom of my images I keep an eye on the images as they come off the camera and tweak the tracking accordingly until the run is complete. That’s the easy part done, but the rest can at least be done in the warm. 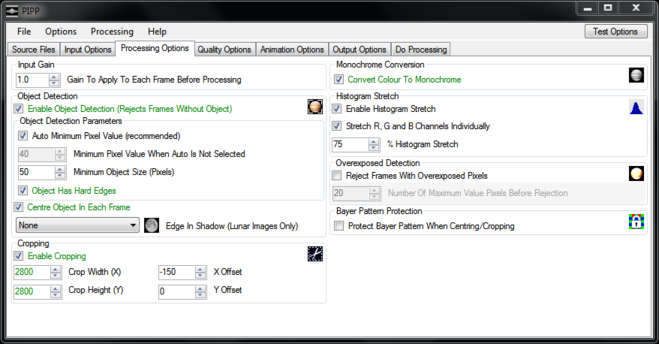 In the “Processing Options” tab, I make sure “Enable Cropping” is selected and change the crop height and width to suit my image. 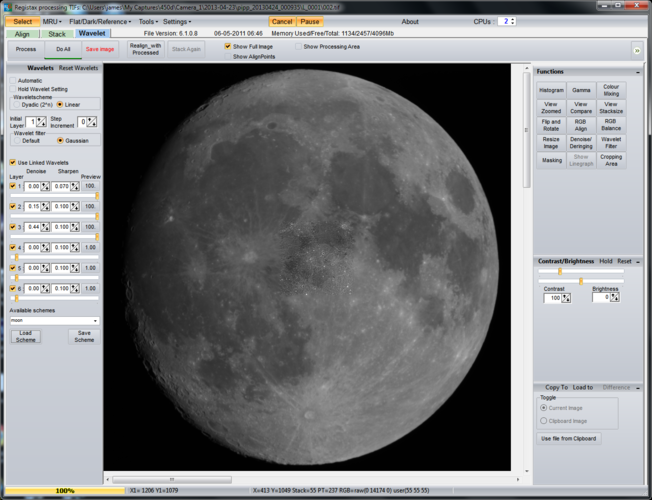 In this example because part of the Moon is dark I also use the “X Offset” to shift the image to the right of the frame a little. 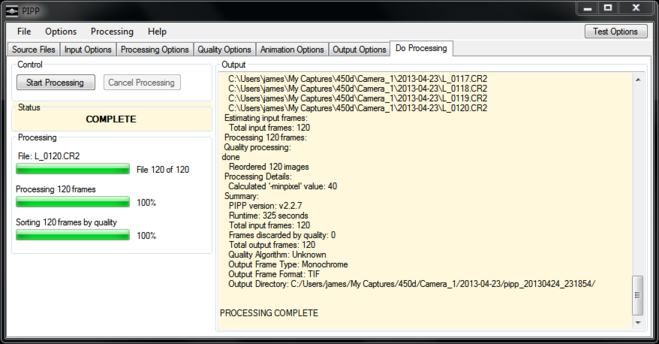 Finally I make sure “Convert Colour to Monochrome” and “Enable Histogram Stretch” are checked. It is possible to create colour images of the Moon, but that’s for another time. 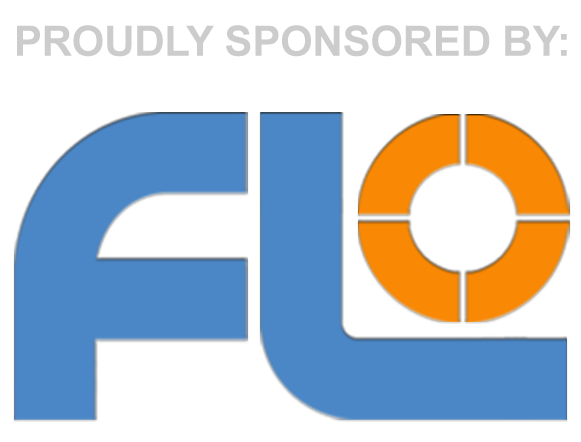 PIPP creates a new folder beneath the one from which the images were loaded containing its output TIFF files. Now the images are converted to TIFF Registax v6 can be used to stack them. Start it up and using the “Select” tab, load the images in all in one go. If there are images affected by cloud they’ll have been renamed to come last in the list. 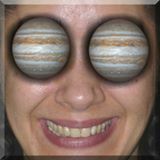 Ones that are obviously dark or that have dark areas due to clouds, aeroplanes or local wildlife should just be ignored. For this set I took the best 100 from my original 120 frames. Should Registax offer to stretch the intensity levels, choose “No”. Next I click “Set Alignpoints”. Registax will usually come back with 1799 for my images which is far too many. I lower to 200 or 300 at the most in the “Number of Alignpoints” box and click “Align”. Now may be a good time to go and make a cup of tea. After being transferred to the “Stack” tab you’ll see an image with the align points shown and often little green lines showing the movement between frames. Ideally those should be as short as possible. I just select “Stack” here. Once the stacking is complete it can be worth saving the image (as a TIFF) to allow it to be tinkered with later. Then it’s on to the “Wavelet” tab and the black magic starts. Unless I want to rotate or flip the image, wavelets is all I touch here. For the Moon I have a default set using just layers 1, 2 and 3 that I load which are very aggressive and then I tend to back them off until I’m happy with the overall image. For speed Registax only shows you a small part of the image with the transform applied, but clicking elsewhere will move the effect around. Unclick “Show Full Image” to see what it looks like in detail. If the image starts to look speckled then it’s overcooked and the sliders need backing off. The point at which the image starts to look unnatural and is probably overdone is often down to personal taste. “Do All” applies the transform to the entire image. Thanks very much for taking the time to write this up James. This is so helpful for me...Just what this forum is about. Still can't get on with V6 myself , will try again later. My other comment would be to drop the ISO down to 200 to lose a lot of noisiness from the subs , would mean shutter speed around 1/250 - 1/400 depending on the phase but in all but the worst seeing ( when you wouldn't be shooting anyway) you'll still catch plenty of clean frames. I find a high ISO (400 +) ends up with the noise being sharpened and a very coarse , grainy appearance in the result , Lunar or Solar. I don't let mine get any brighter than this , where the lit up tips just get white . Great write up James, covering the process from beginning to end. Without this enabled I found that Reg6 would very often produce badly aligned images with multiple edges. This just helps PIPP to do a more consistent alignment between frames which seems to make life easier for Reg6. This is a good point. Exposure time and ISO setting need some experimentation. I found that when I dropped the exposure time down I had a hard time getting a nice clean image stack. Depending on the focal length and speed of the scope the sweet spot may well change. In APT my histogram gets about 50% of the way across the graph. 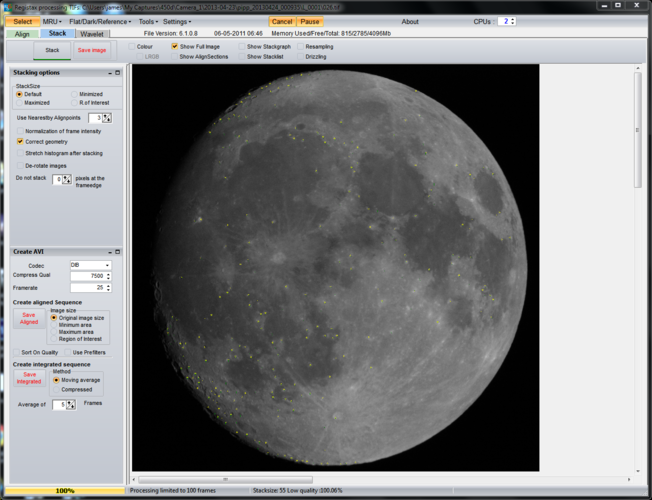 That's about as far as I'd want to take it for lunar imaging. Thank you Chris. 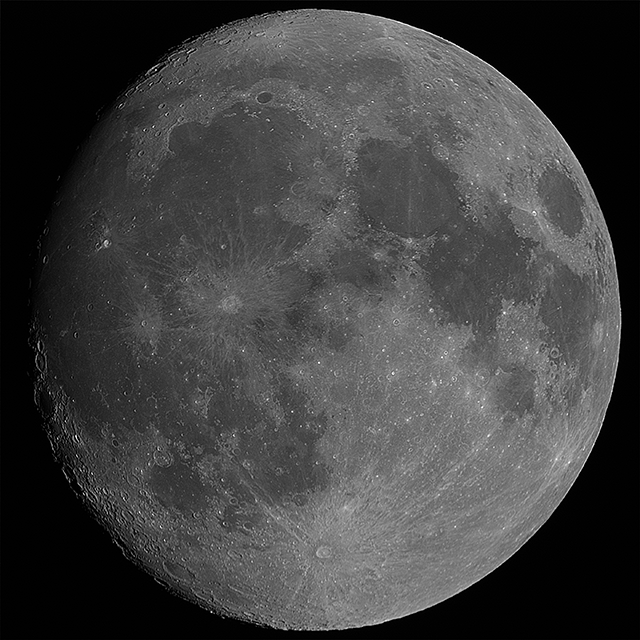 Registax 6 really doesn't seem to cope well with variations in contrast. 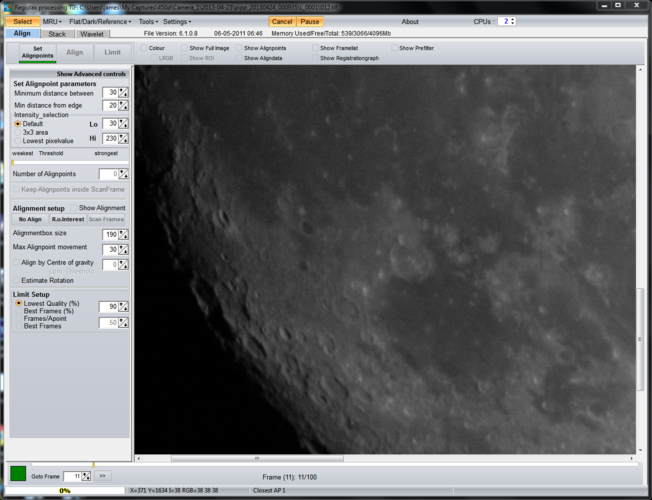 I stick with it for lunar and solar image stacking because if the data is good for me it beats v5 every time. However like the little girl in the nursery rhyme, when it is good it is very, very good, but when it is bad it is horrid. I'll give the "edge in shadow" option a try. Excellent write up, thanks for taking the time to do so. 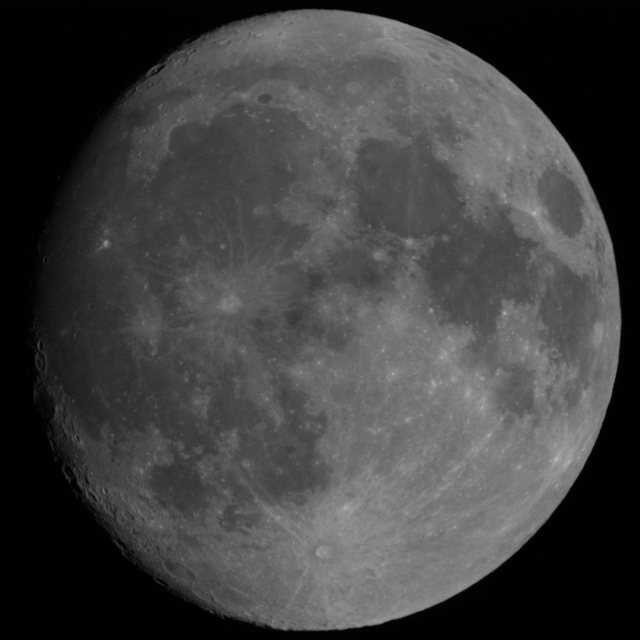 I really need to try out PIPP as I haven't had much success stacking dslr lunar pics. Superb write-up James - hugely useful. Thanks! Exellent write-up and thanks for passing on your tips and experience with R6 (I still usr R5 as I'm a bit of a luddite!). I can't thank James, and also Chris and Steve, enough for passing on their experience and advice... I have been struggling for so long but have finally produced an image I am not ashamed of!! There were times I never thought I'd do it!! Can't praise you guys enough for the help you provide. It was still light when I took these captures and this is the first time I've ever used Registax (Never had anything worth stacking) so please don't be too harsh!! There were some odd things happening! Thanks again....I feel I'm on the way. That looks like a good start to me. 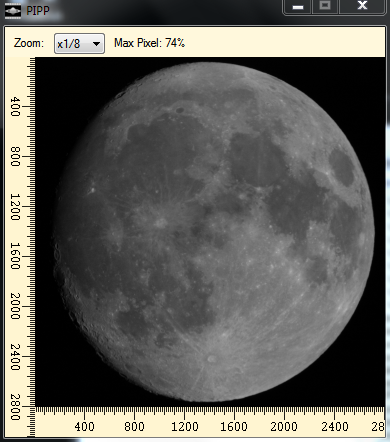 I've converted it to PNG because they're a lot smaller and display inline, and given it a bit of a histogram stretch using GIMP (though you can do that in Registax too in the wavelets section). You can see there's plenty of detail there. Well done. WOW! WHat an amazing post! Thanks for this one, James, you just made my month! Thanks for the link to your post. Great article. Well written, very informative and helpful. 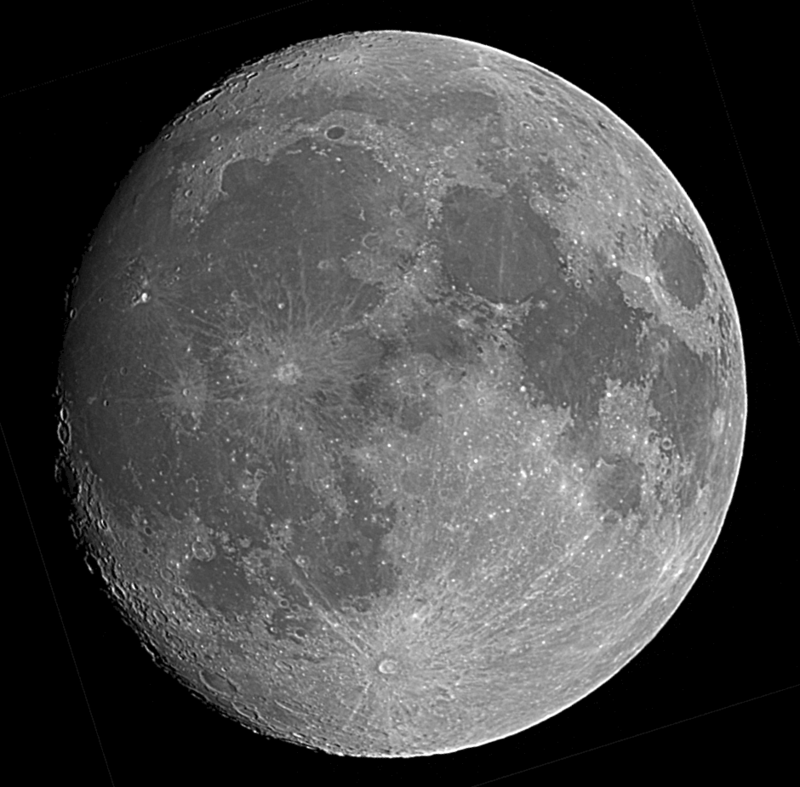 Thanks, James, I wasn't sure how to go about stacking multiple DSLR moon shots. Look forward to giving it a go! To add a footnote to this, with my 450D and 127 Mak I have now been able to reduce the exposure time and ISO setting to 1/200th @ ISO200. When I have tried this in the past I've had severe problems with ghosting in the images which appear to be solved by configuring APT to delay activating the shutter for two seconds after the mirror is locked up. I think this has made a noticeable improvement to the quality of my images. I assume that if you aren't able to use APT or a similar application for image capture you may need to stick to higher ISO settings and faster exposures. Brilliant thread James, BTW I currently use a Canon remote shutter release and the mirror-lockup option works on first press and shutter works on second so no more ghosts. With this arrangement I can use ISO100 and exposures of around .01 seconds when using an IR filter. I will be using APT once my obsy is built. Brilliant post. I've saved it to favourites and will give it a go. Oh, for the clouds to clear! Perfect! 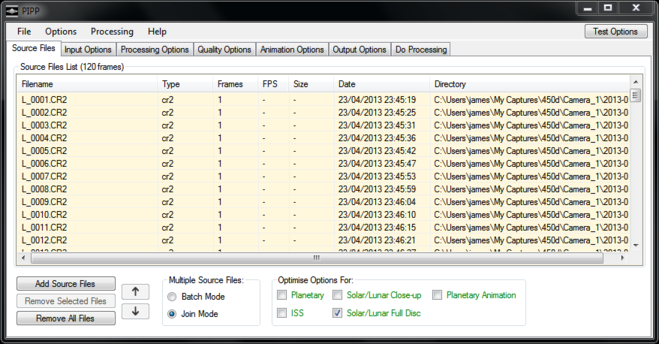 Just what I need to improve my lunar images! Thanks for posting! I believe if you buy anything from the 450D on then only those that come with the camera. The only cable I use is the (supplied I believe -- my camera was second hand) USB cable between the camera and laptop. Other things that may be useful along the way are a programmable remote release (about £15 from Amazon) and a mains power connector (a fake battery that connects to a transformer), but they can wait. If you can still find one, the 450D is a good choice. If you want something newer or want to buy new then the 1100D may well be the one to go for. People are quite successful with other cameras in the range however. Thanks for the info!! I need to look into "how to mod a DSLR". Is it difficult? Depends what mods you want to do I think. Removing the IR filter and replacing it with a clear filter is quite common and a few people have done that themselves though it does involve taking the camera apart. I've done nothing to mine however. It's absolutely stock.